I use Skype all the time. As for Vonage, when I see the name I get their annoying theme song stuck in my head, but other than that I get it confused with the Chevy Cobalt which briefly used the same music--uh, what is a Vonage? Is it a telephone, or an economy sedan? Whether it be consumer or enterprise, all companies should think about how they can utilize the Internet for delivering their product. The more you do over the web (market, sell, deliver product, run your service) the more you can scale your business with incredible efficiency. After all it only took Skype 2.5 years and $20mm of capital to create $2.5-4b of value .... While Vonage is doing quite well with its growth, it still requires an incredible deployment of capital and it still requires users to wait for hardware to be shipped to their house before using it. There is more friction in using the Vonage service as compared to Skype. Aha! Vonage is a phone, sort of....but it's harder to buy than a car? By the way, I've never given Skype a nickel. I use their chat and PC-to-PC telephony for free. But if I were to use broadband phone service (and someday I'm sure I will), Skype will have me at "Hello." Skype's marketing plan is the opposite of the old bait-and-switch. 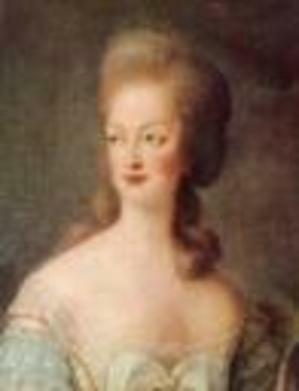 It's more like Marie Antoinetworking: Free cake, come and get it! ...and nobody much minds paying for the birthday candles if the cake is free. So far as I know, McAfee invented this marketing device in 1989 when they gave away virus software--and charged for premium services. The idea is that you can corner a truly vast market, and do so without spending on advertising, when your loss leader is bigger than your product. This model doesn't work for every business--wouldn't work with real cake, for example, since sugar and eggs do cost money. But when you're an internet service company, it's going to cost you a lot less in the long run to give stuff that doesn't cost you anything away than it costs to buy airtime during an episode of Fear Factor. 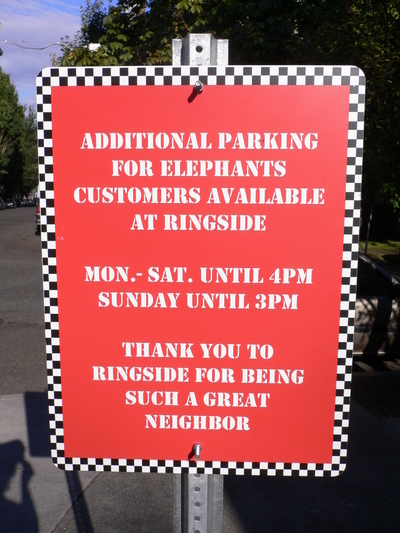 Additional parking for Elephants customers available at Ringside Mon-Sat until 4PM Sun until 3PM. Thank you to Ringside for being such a great neighbor. Elephants is a venerable, family-run delicatessen in Portland, OR, that serves a magnificent tomato-orange soup. Ringside is an equally venerable steakhouse around the corner that serves the best onion rings I've ever had. This sign is great on many levels. It tells you where you can park, and when. It also, by inference, tells you when not to park in Ringside's lot, i.e., when they're open for dinner--but it does so without saying "no" or "don't" or sounding like a bunch of rules. And by thanking Ringside, Elephants gives the restaurant a gracious plug--saying, in effect, "Wouldn't you like to patronize this other fine establishment run by some other nice people?" Unlike the sign at Powells, this sign assumes that you, the customer, are as much of a mesch as the people at Elephants and Ringside. What good company to be in! The world is a wonderfully delicious place, full of kind, honorable, thoughtful folk who appreciate good food and drink and gentle manners! If Elephants had written the Powells coffee shop sign it would have read something like: "Feel free to bring a few books to your table.... but please leave magazines and expensive art books outside (creases and crumbs, you know)." A sign like that would have made me smile instead of scowl. I once sat in a dirt-floor cantina in the Amazon Jungle and bonded with strangers over our mutual love of this bookstore, and when my novel was published when I was 26, seeing my name on the marquee at Powell’s was every bit as meaningful to me as seeing it on a dust jacket. Powell’s has always been the greatest bookstore in the world, in my opinion, and still is, although today it annoyed the hell out of me with an act of utterly absurd managerial snivelry. 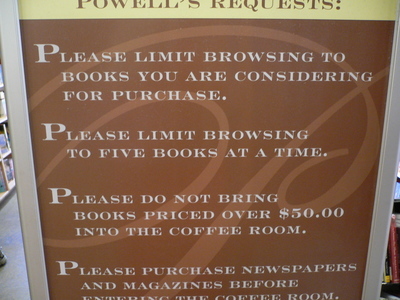 Now, a bit of history: Powells was one of the first bookstores anywhere to have a coffee shop. There were never any restrictions on bringing books to the tables--we Powell's shoppers treated the bookstore like a semi-private club, and the Powell family trusted us. We’d also earned the privilege by being such avid, loyal customers that the store grew to occupy two floors of an entire city block, with several satellites. It's bigger than a Costco! So what's the deal with this bitchy, bitchy sign? Were there really so many immoderate customers that making the entire clientele feel unwelcome was warranted? One of the books I took into the coffee shop at Powell's was Why We Buy by Paco Underhill, an anthropologist who studies the behavioral patterns of shoppers. Underhill has actually quantified the sales lost in stores where printer cartridges are kept under lock and key to prevent theft; the losses incurred by allowing frustrated customers to leave without buying anything are far greater. (He is also withering on the subject of makeup packaged so you can’t try it, and dressing rooms that make you look fat.) Will Powell’s lose sales from this new snarkiness? Maybe I should have voted with my pocketbook, but I did buy four of the six books I took into the coffee shop. Mavis is going to stop, read the sign, and then quickly count the books she has in her arms. “One, two, three....seven! Oh no!” And she's going to panic, wringing her hands and thinking, "But I only need to buy one!” After much consternation, she will turn on her heel, sadly return the stack of books to the shelves, and go pick up the kids from soccer. Then she’ll go onto Amazon from home, where she’ll get a hearty “Welcome, Mavis!” and a list of recommendations. Meanwhile, the book-abusing scofflaw who is the intended target of the new sign will read it, snort derisively, and walk right on in. Dammit, I expect to be treated like chattel at Circuit City or Ross Dress For Less. But Powell’s! It saddens me to think that the mecca of my childhood is now just another adversarial retail environment. Maybe they should read some of the books in their excellent business section.